No doubtly , Halong Bay is the true wonder and natural heritage site which is recognized by UNESCO. Around 3 thousands limestone karsts and islets rising from the emerald water that creating the second to none wonder of the world. No mater how many pictures, stories, and movies of Halong Bay you can come across, you can’t help be amazed when you see this wonderful place by your own eyes. 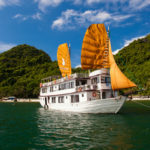 You are looking forward to seeing Halong Bay but wondering how to choose the best cruises for you and your family.” Tips and Advices ” from us and other people who have ever experienced will be useful for you. Please do not pay thousand dollars for the wrong ones and do not make your holiday spoiled . Decision is yours . Your trip at your fingertip. 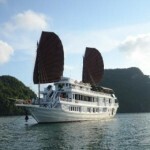 Cruising around Halong Bay can be enjoyed from small junk boats or luxury cruises. There are about 500 licensed boats, and on any given day, up to 300 of them will be plying the water. Therefore, choosing the best cruise in Halong Bay can be a hard job. 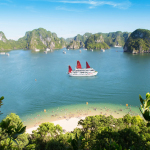 Here are some tips for you to pick the best cruise in Halong Bay. 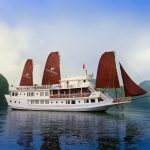 – Some best cruises in Halong Bay are the Paradise cruises, Emeraude cruise, Bhaya cruises, Emotion cruise, Dragon’s Pearl and Oriental sails. You can search on Google for the website of these cruises. However, please make sure that you are landing the right official website because there are many fake websites selling these cruises out there. – Don’t look for the cheapest option because the services and the safety are cheap too. Please ask what are included in the price and if safety equipments are provided on the cruise. Please remember that you’ll get what you pay for in Halong Bay. – Better prices are often offered by reputable travel agents or specialists. The prices listed on cruises’ websites are public prices which are more expensive than travel agents’ prices. In the low season from May to September, the prices can be 10 – 20% lower than the high seasons. – Budget cruises are often full of guests and you can’t do much about the quality of food and services. Midrange cruises are better in terms of cabins, food and services. They can also easily adapt your special requests. The luxurious cruises can better satisfy you with additional services such as wifi, or massage. You will be also satisfied by the delicious food and beautiful cabins on these luxurious cruises. – Check the weather before you go. If storms and rain are forecasted, you should not go because the cruises can be canceled in the last minutes by the Authority of Halong Bay. The best time to visit Halong Bay is in April or November. You should also think about the alternatives in case the cruise is canceled. – Do your homework before you book the cruise. There are hundreds of cruises in Halong Bay which means there are thousands of tour operators and travel agents selling these junks. The prices are various and can be hundred of dollars different. So making research on the internet before booking the cruise will save your money and have great experience. You can compare the prices of all cruises here. Decision is yours . Your trip at your fingertips !